Optimal 68° apparent field of view, the largest accessible to the stationary human eye. 8 lens elements in 5 groups provide perfect sharpness and colour correction over the entire field. Comfortable eye relief of 20 millimetres. No vignetting or fall off of illumination near the edge of the field. The use of high-index glasses results in minimal distortion and astigmatism. Unsurpassed colour fidelity. Many eyepieces that employ cheaper glasses or inferior designs impart a yellow or blue cast to the image. The most advanced anti-reflection multicoatings are employed on all ten air to glass surfaces for maximum light throughput and brilliant images. All coatings are carefully matched to the index of refraction of the glass substrate. The painstaking design and execution of baffling has all but eliminated troublesome stray light and ghost reflections. The Baader Contrast-Booster is specially designed to improve Refracting telescopes- to provide a professional replacement for the simple "dark green" Moon Filters made of "raw polished" glass. Removes the bluish "hue" (lack of contrast) during lunar, planetary, solar and terrestrial observation! Strongly emphasizes surface detail on Jupiter and Mars! If you have never seen the GRS (Great Red Spot) on Jupiter - with this filter you will! Over 95% transmission - provides a bright, brilliant image compared to the usual dark green colour filters, used to bring out detail on Jupiter. Colour recognition will be retained! Removes distracting false colour and the resulting smeared and washed out image details. You have never ever seen the Moon (or the Sun with AstroSolar Safety Film) so tack sharp in an economy priced telescope! Help to reduce atmospheric "stray light" (skyglow). No deterioration of resolution with magnifications of 150x and more - as with "raw polished" (flame polished) glass! Drastically improved contrast for all reflector telescopes, without loss of bright-ness! Transmits a maximum of light , while blocking unwanted skyglow and many street light emissions. Especially effective on smaller telescopes which cannot benefit from expensive narrow-band nebula filters due to the huge light-loss involved. Combined with an UV/IR-Cut-Filter for all CCD and digital camera work. This combination works extremely well due to cutting all unfocused light an absolute MUST for digital imaging. No image degradation as with flame polished filters. The BAADER Fringe-Killer Filter minimizes unwanted blue fringing, comparable to a Minus-Violet-Filter, while retaining a very pleasing color balance. The brightest image of all color-correcting devices in the industry, makes the Fringe-Killer a must for even the smallest of refracting telescopes. Breaks the intensity of the devastating false blue colour in a completely new way, never ever before manufactured as astronomical filter. 50% transmission in the blue spectral region from 450 nm to 480 nm being much more complex to produce than even the narrowest of all Nebula Filters. Retains the highest light transmission of all known colour correcting devices be it filters or lenses in all important deep sky wavelengths from 486/501 up to 656 nm. LIGHT is the hottest commodity for high magnification work. Built-in Infrared Blocker, ranging from 656 to 1150 nm, makes it the perfect tool for CCD work, as well as afocal projection-photography with digital cameras for Moon & Planets. Combine with our NEODYMIUM Moon- & Skyglow Filter # (with Phantom-Group-Multicoatings) for breathtaking contrast on lunar and planetary surface detail! No deterioration of resolution with magnification at 300 times or more as it would happen with the usual flame polished (raw polished) glass, commonly used for all sorts of filters! Coating: Plasma assisted, hardest, scratch proof and water impermeable dielectric coatings of almost 50 coating layers on either side, most carefully designed to extend equal tension onto either side of the substrate in order to retain a highest quality optical figure. Will make the performance of a simple f/8 economy refractor look like a classic f/15 Fraunhofer-Achromate. See it to believe it! The only infrared blocker in this price range featuring a planoptically polished substrate, parallel to within 30 seconds of arc! In combination with the unique properties of the Baader-Contrast-Booster the resulting spectral window eliminates all known effects of image deterioration - an absolute MUST for digital imaging. Baader Planetarium delivers the latest tool in the planetary imager's bag of tricks. The Baader IR-Pass filter blocks wavelengths below 670 nm. At these longer wavelengths, planetary images are less disturbed by wavefront distortions in the atmosphere (seeing). By combining a luminance image taken with the IR-Pass filter, along with RGB frames, overall image sharpness is significantly enhanced. Some of the world's best amateur planetary images have been taken with this technique. Suitable for digital imaging only. The UHC-S delivers a darker sky and improved contrast over typical broadband 'Deep Sky Filters', but without sacrificing all the stars like other 'UHC' filters. The moderate 60nm passband and extreme efficiency makes this filter great for smaller scopes as well as the giants. Ideal for imaging, too (with >99% transmission of H-Alpha). All substrates fineoptically polished. These filters by far supersede the mediocre quality of common "flame polished" colour filters. Fineoptical polish and 2 mm thickness allows these filters to be inserted anywhere into the optical path without introducing astigmatism or other defects. For instance they can be used in front of a binocular viewer without degrading the image in any way. Substrates are free of striae and planeparallel polished to within 30 seconds of arc. This eliminates any double images or ghosting due to wedge errors in the glass. Transmission efficiencies for the three longpass-filters (Yellow, orange and red) peaks at 98 %, while the efficiency for the three bandpass-filters peaks at almost 70 percent - unheard of for a simple colored glass-filter! All filters have standard 1 1/4" eyepiece filter threads, tested and optimised to fit almost all eyepieces on the market. Each filter cell has a male as well as a female thread to allow stacking for narrower passbands or to combine with our UV/IR-Cut-filter. The combination of the redRG 610 (# 2458307) and IR-Cut-filter (# 2459207) for instance results in an extremely narrow H-a passband-filter - at an incredibly cheap price. Unsurpassed contrast of photospheric details is achieved by an extremely narrow half bandwidth of only 8 nm. Functions like a monochrometer, suppressing the effects of atmospheric turbulence to provide images that appear markedly more stable. Focus Sweet Spot Generator  completely eliminates the usual focusing guesswork  the image snaps to a razor sharp focus at the exact focal position. Image the sun the way professionals do! Note: Use only in combination with AstroSolar Safety Film or other safe prefilters. Delivers the absolute highest contrast views of many diffuse and planetary nebula. For many objects, the Baader O-III reveals a level of intricate detail that rivals the best deep sky photographs. Our favourite filter for the majority of nebula, especially The Veil, Lagoon (M8), Swan (M17), Ring (M57) and Dumbell (M29). With a large scope, you can even view the famous 'Pillars of Creation' in M16 (Eagle). Baader Planetarium is a safety film for solar observation. It is made for the construction of high-quality objective-filters for observing the sun with telescopes, binoculars, camera or video-lenses. This foil is CE-tested and reduces the intensity of sunlight by 99.999%. Baader Planetariums AstroSolarTM safety film is a specially manufactured streak- and blister free foil. It attains the optical performance of plane parallel glass filters. The base material is not "Mylar"!. The basic development of this film was made in laboratories for nuclear- and particle physics. High density coatings on both sides of the foil ensures a highly uniform filtering, while neutralizing the occasional microscopic holes in the coating. The image of the sun is extremely contrasty and of almost neutral colour. Made of black anodised aluminium. Its large 40mm clear aperture makes finding objects easy. It is equipped with a variable brightness control, azimuth adjustment control, and altitude adjustment control. To use the Finder, simply look through the sight tube and move your telescope until the red dot merges with the object. Extremely fine sprayer ensures long lasting economic use. Not suitable for use on Acrylic plastics. 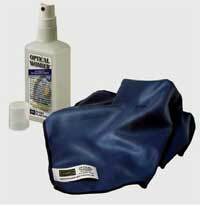 A cleaning cloth made of supermicro fibre material , cleans dirty optical surfaces without damaging delicate coated optical surfaces.